Rosie got in touch with me to enquire about a cover for her romance novel, Write into My Heart, a book set in the publishing world in London. She had been traditionally published in the past under a different name, and this was her first foray into producing ebooks independently, but she brought with her a wealth of knowledge from her time in publishing. 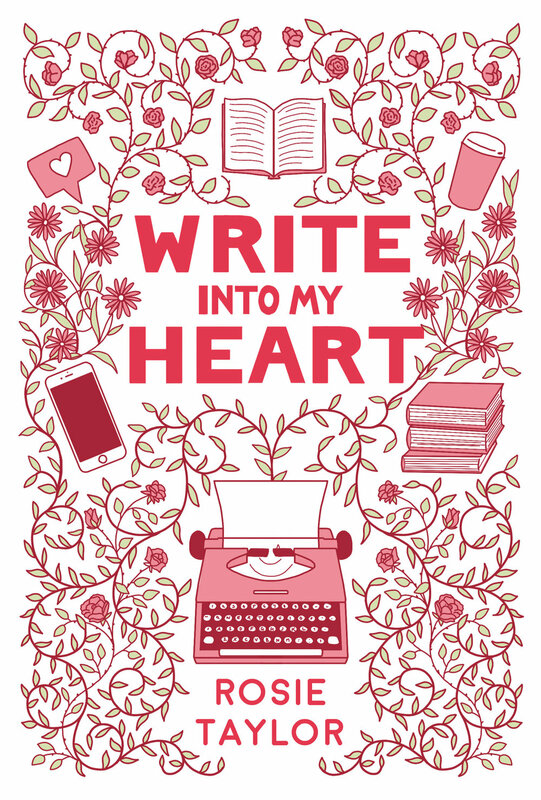 Write into My Heart is about Esme, a woman in her early twenties trying to make a name for herself in the world of publishing. She's working as a publicist, but has dreams of writing and publishing her own book. Love is not on her radar, she's all about her career. Enter Harry Beaumont, her condescending, rude and frustratingly handsome boss who comes in and crushes her new book proposal. Esme must struggle to salvage her career whilst maybe, accidentally, falling in love. This was for use on Amazon to begin with, so it needed to work well as a thumbnail. Rosie sent me the covers of some comparable titles and we discussed which of my designs she liked from the past. She suggested something along the lines of The Heart of Jesus Valentino and The Garden Party. Rosie's target audience was romance readers who enjoy the likes of Sophie Kinsella and Marian Keyes. Some books similar to Rosie’s. The first round of designs were along the lines of the titles Rosie mentioned but with more bookish imagery. I kept everything quite big at this stage, as this was going to need to work well one a small scale. Rosie thought the elements were a little too big and that perhaps the title needed to be bolder and less like handwriting. The bolder sans-serif text actually worked better at a small scale. I experimented with some different types of flowers, setting them against books, a typewriter, coffee cup and mobile phone. From here I added more detail, switching the sunflowers out for more delicate vines at Rosie's request. The colours were a challenge. Romance titles tend to use more pastels and feminine colours, so it was difficult to get the contrast high enough for the title to stand out. I tried out a variety of different pastel coloured backgrounds, as shown here. My personal favourite was the one with the navy background and gold filigree, but I knew it wasn't quite right for the book and genre. I sent these through to Rosie, advising that we go for the one with the white background and pink elements. This one had maximum contrast and it fit in with the comparable titles in Rosie's market. Are you an indie author in need of a book cover? Click here to get a free quote.